Suzie Sugar fairies are Christina's little friends. They teach Christina how to bake cakes and sweets. Their pink and peppermint green dresses have short party dress skirts. Their whipped-cream shaped hats are made of felt and embellished with beads. There are two hairstyle and color ways for this Petite. Each doll will be sold separately. Their gingerbread man handbag adds sugar and spice to their outfits. Their eye shadow is light brown and their lips and cheeks are lovely pink. Their eye color is light blue and looks like sweet candy! 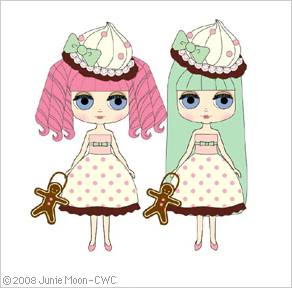 Both Suzie Sugar pink and green have the same clothing, makeup, and eye color. Only their hair styles and hair color are different. "Suzie Sugar" pink will be available with pink pigtails. 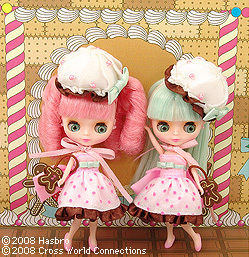 "Suzie Sugar" green will have long straight, peppermint green hair. 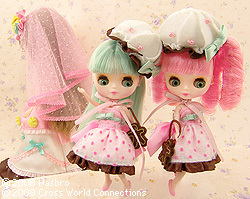 [ The set includes: ] Doll, headdress, dress, bag, shoes, and stand. *Each doll is sold separately.